Lock in a great price for Hotel Stadt Melk – rated 8.6 by recent guests! Very central location with secured parking space. Breakfast is great and view of the city square from the room is lovely. Very pleasant stay in this hotel. Staff are great and communicated very well the arrangement prior arrival. Room was clean. Bed was comfortable. Reception staff is very kind. Hotel is very clean and in city centre, right in the main square so everything is close what you want shop, restaurant, and melk abbey, bus stop to Durnstein. If you come from the main square, reception is on the second floor. I am satisfied with my choice with this hotel. We stayed in Twin room (en suite). The location was good and the hotel had the potential to be very nice. The hotel was very conveniently located to everything in the center, including restaurants, shops, the Abbey, etc. The private parking is also very convenient, just across an small road/alley from the front door of the hotel. The staff was very friendly and helpful, providing restaurant recommendations, a map of the Wauchau valley wine region, etc. In addition, we had booked a hotel without AC but it was unseasonably warm and the hotel had proactively set up a fan in our room which cooled it down quite nicely. We would definitely recommend and would stay here again. this is a great little hotel in the heart of Melk. The Abbey looks over everything and is very scenic. We had the ground floor suite with a sauna and were very comfortable. Note there are 4-5 stairs to get to the ground floor. Hotel Stadt Melk This rating is a reflection of how the property compares to the industry standard when it comes to price, facilities and services available. It's based on a self-evaluation by the property. Use this rating to help choose your stay! 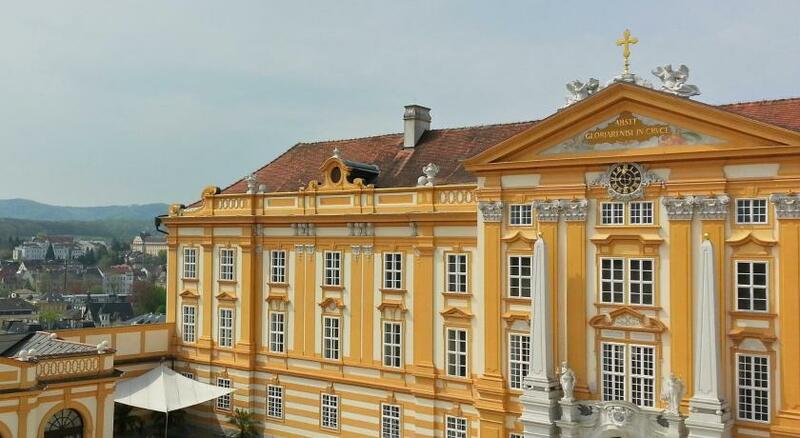 Located 1,950 feet below Melk Abbey, which belongs to the UNESCO World Heritage, Hotel Stadt Melk offers free WiFi and parking, and newspapers. Rooms feature TV with cable channels, a telephone, desk and a bathroom with a bathtub or a shower, a hairdryer and a toilet. All rooms offer a view over the old city of Melk, and some feature a private balcony. At the Hotel Stadt Melk, guests will find a furnished terrace. Free safety deposit boxes, a bicycle garage, luggage storage are available and business facilities are at the guests’ disposal. A rich breakfast buffet with regional and homemade products is available and there is a bar on site. A supermarket is 350 feet away. The Danube bike trail is 350 feet and the city's train station as well as the Danube ferry pier are 650 feet from the property. Arena Melk Event Center is 2,300 feet and Mountain Jauerling is 6.2 mi away. This property also has one of the top-rated locations in Melk! Guests are happier about it compared to other properties in the area. When would you like to stay at Hotel Stadt Melk? House Rules Hotel Stadt Melk takes special requests – add in the next step! Hotel Stadt Melk accepts these cards and reserves the right to temporarily hold an amount prior to arrival. Nothing. But if need to say, there's no lift but the staff is a gentleman and willing to help for carry my luggage up the stairs. Superb location just at the main square, right at the foot of the stift, an excellent point for photo shot. Free parking. Spacious room even I booked a budget twins. Plentiful breakfast with various sorts of bacon, fish, cheese and fruits. Very good hotel Garni located on the town square. Lots of restaurants within a 100m radius. Friendly staff, but they are not enough informative and helpful. The rooms and other premises are dirty. The dinnerware set (like plates, cutleris) are not clean. There is absolutely NO HOT BREAKFAST (like scrambled eggs, sausages, fried bacon ... etc). You can choose only cold cut, cereals, fruits, yoghurts for breakfast. You cannot regulate the room's temperature. There was heating only during the night. We felt very cold in the bathroom during the day. According to booking detailed room information our room should have include a trashbin, a water kettle/boiler for making hot water, an iron, and some wine or champagne, but none of these services was included. We were surprised that we could not throw away our garbage. Staff very friendly, room clean and big. Very nice place. Clean and with nice design and very fiendly staff. This hotel is the best hotel I have stayed in in my month long journey. The proprietors are French so the breakfest is wonderful . The decor has a French asthedic with beautiful pictures on the walls and tasteful rooms and modern design. The staff is helpful for those who speak English, and can help you find things to do. There are wine glasses in the room and they serve wine by the glass. Remember you are near wine country. The bed could have been made once in a while during our 3 night-stay. Only downside was the shower - it was very awkward with clumsy folding glass pane, poorly placed taps and you had to step into the bath. No fridge or kettle in room. Location is fabulous. Right at the base of the Abbey and well located in the town of Melk. No lift, so there are a few steps but they are only to ready to help with the bags. Very clean and comfortable.